Puppies must learn to move properly, or gait, for the show ring. Whether you're planning on hiring a handler or showing your puppy yourself, you will need to train your puppy for the show ring. While judges give puppies some leeway when they first start showing at 6 months old, as puppies mature they are expected to start behaving properly. Work with your puppy on standing still. Don't worry about specific foot placements at first -- standing still is a big enough challenge for puppies. As she gets used to standing still, place her feet in the proper place and teach her to keep them there. The exact positioning may vary by breed. Enlist friends to help you train your puppy to stand for an examination. She will need to stand still while a judge approaches her, opens her mouth and looks at her teeth, and performs a hands-on evaluation from nose to tail. Sometimes the judge will ask the handler to show the bite, so you will need to learn this skill. Develop your puppy's free-stack, or self-stack. Once she understands where her feet should be placed, start asking her to get herself into position. This is where the attention training comes in handy; use bait or a toy to coax her to step forward or to the side. Stepping slightly into her space will cause her to step backward. With practice, you can use subtle finger movements or toe taps to get her into a perfect free stack. Introduce a show collar and lead. Show collars for puppies are usually nylon or chain slip collars with a separate lead, although some breeds are traditionally shown on martingale collar and lead combinations. Practice quickly slipping the collar on and off of her head when she's stacked if that is customary for her breed. Practice moving at the proper gait and speed for the ring. Most breeds are gaited at a trot. With puppies, the first goal is to keep them from bouncing around the ring. 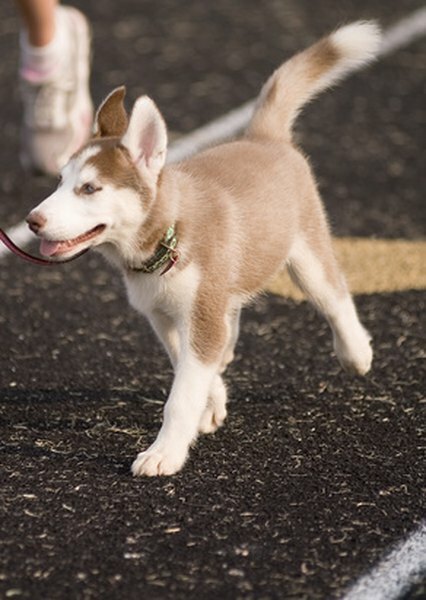 Once they're keeping their feet close to the ground, work toward gaiting on a loose lead with ears and eyes forward. Become familiar with the various ring patterns -- down and back, around, diagonal, triangle, L and T -- and learn how to perform them smoothly and effortlessly. Try to attend conformation classes in your area. Most are held on a drop-in basis and are set up as a mock show. The trainers are usually dog show handlers who can help you develop your skills or troubleshoot problems. Practice in front of a mirror whenever possible, or have a friend record your training sessions. You can then see what the judge will see and adjust the picture accordingly. It's the nature of showing dogs that you will lose more than you win. In many breeds, dogs are not ready to win until they're older, but showing a puppy helps them gain skills and socialization. Don't get discouraged if your puppy doesn't win right out of the gate. How Old Should a Puppy Be to Train for an Underground Fence? How Old Are Dogs Supposed to Be to Start Eating Food? What Age Do Puppies Start Retrieving?